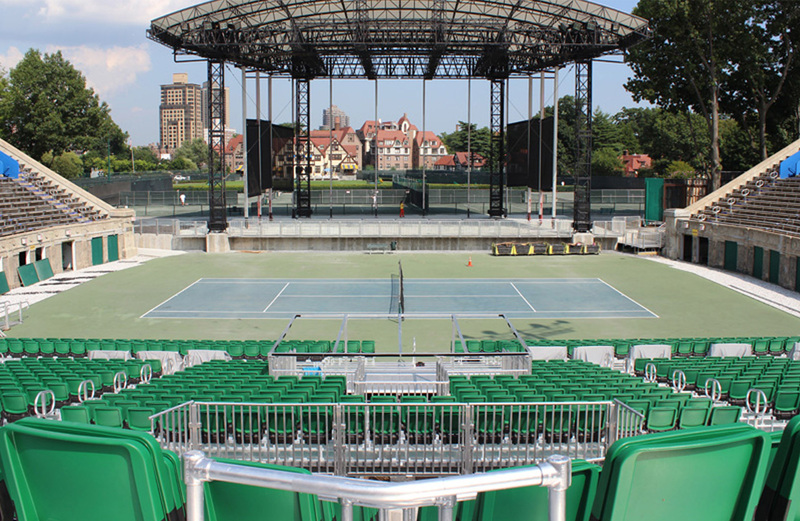 Forest Hills Stadium, at the West Side Tennis Club. 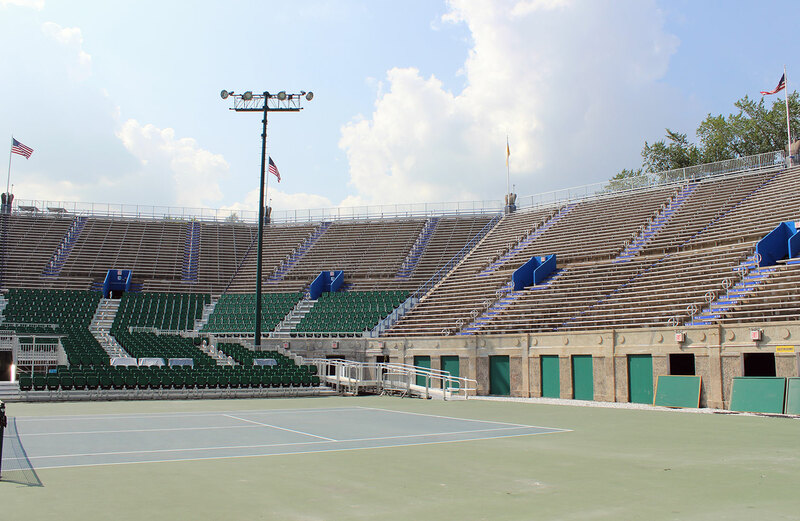 Seating Solutions recently was retained by WSTC Events LLC to rehabilitate the 91 year old concrete stadium structure at West Side Tennis Center at Forest Hills Stadium. This facility has a pedigree of previous performers including The Rolling Stones and The Beatles. 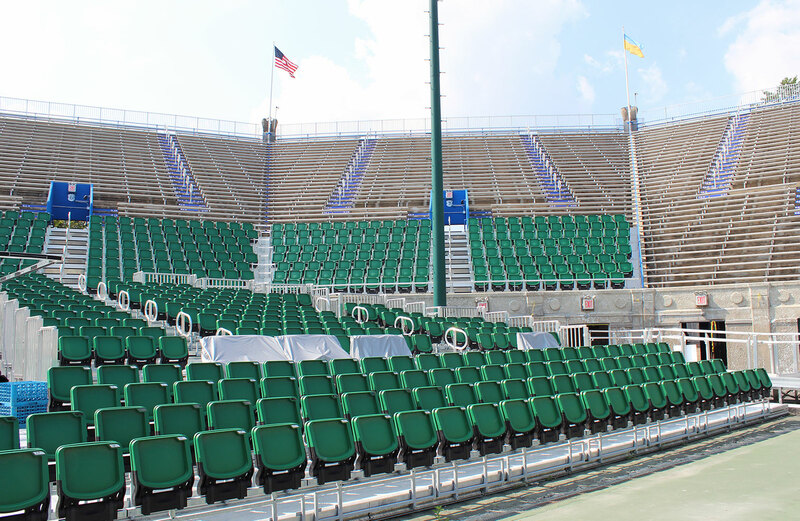 The project consisted of taking an old concrete stadium, removing the old wooden benches, redesigning the bowl to a comfortable capacity while increasing entry and exit point and widening aisles to give spectators a quality overall experience. Seating Solutions created an innovative aisle widening system to fit over the existing concrete midsteps and add the safety of aisle lights without the expense of running electrical conduit to each position. In addition, wood planks were replaced with larger contoured aluminum planks for comfort. Because of the existing miter design layout, Seating Solutions made the decision to eliminate dangerous corners and instead installed branded tables at each miter. 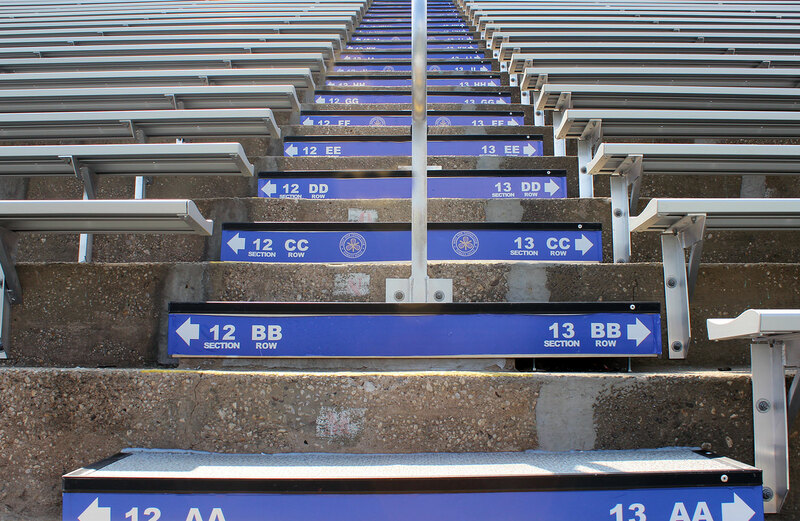 These served as a deterrent to spectators climbing up the open corners instead of utilizing aisles. This innovation added to the safety, appearance and traffic flow of the facility. The next challenge was to create an upgraded VIP experience without damaging the existing structure. 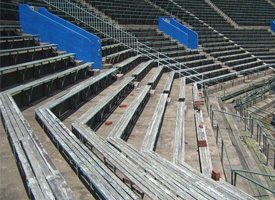 Seating Solutions recommended re-raking the structure. This is a system of new frames that actually sit on top of the existing concrete. 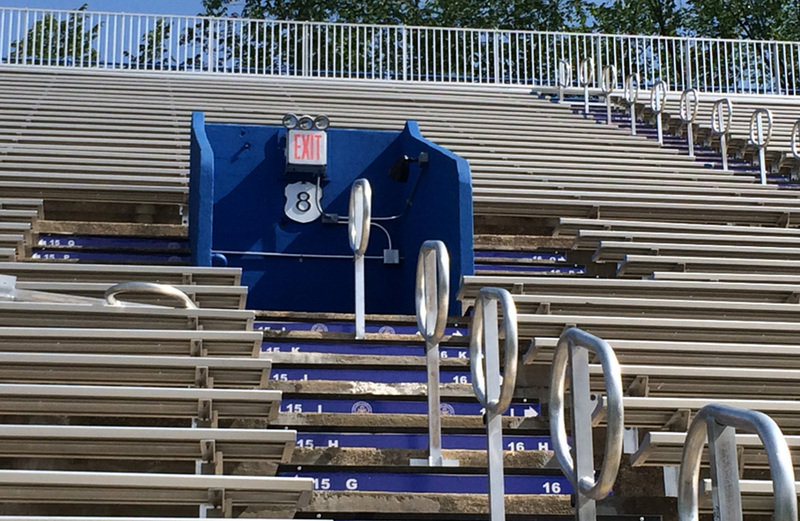 This system changes the closed rise and run of a bleacher to allow for comfortable new installation of a stadium flip up chair. 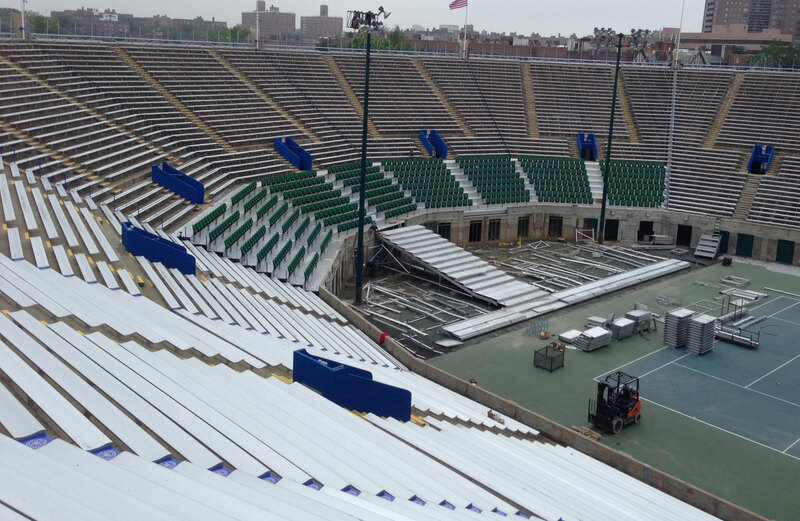 The re-rake system section ends with a seamless transition into the existing concrete stand. 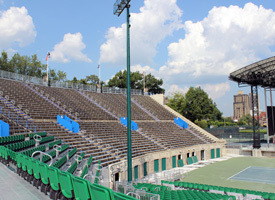 We re-raked the 8 center sections of the concrete bleacher seating to accommodate 696 seats stadium VIP flip up chairs. This re-raked seating section remained accessible through the preexisting entry/exits of the concrete structure. 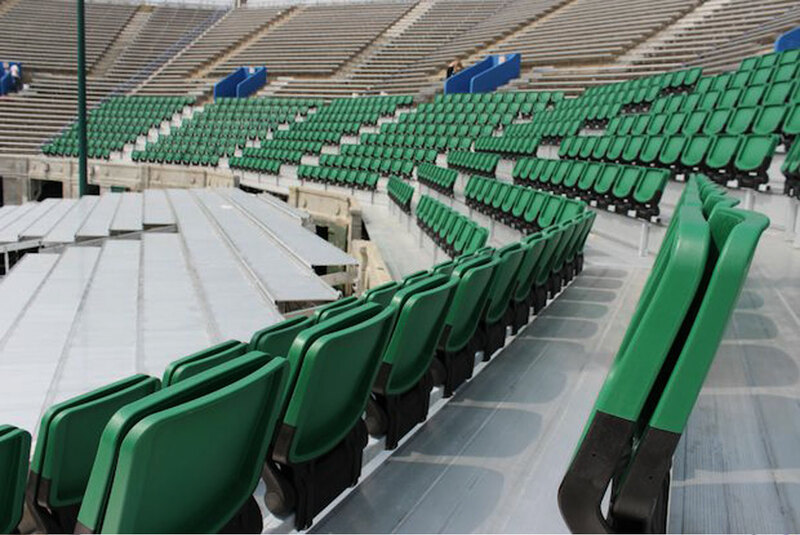 Seating Solutions innovation included expanding this VIP flip up stadium seating section in front of the stadium wall down to the floor level increasing the VIP seating with floor access to add another 614 seats flip up seats. It was necessary to incorporate a sound booth into this seating section. 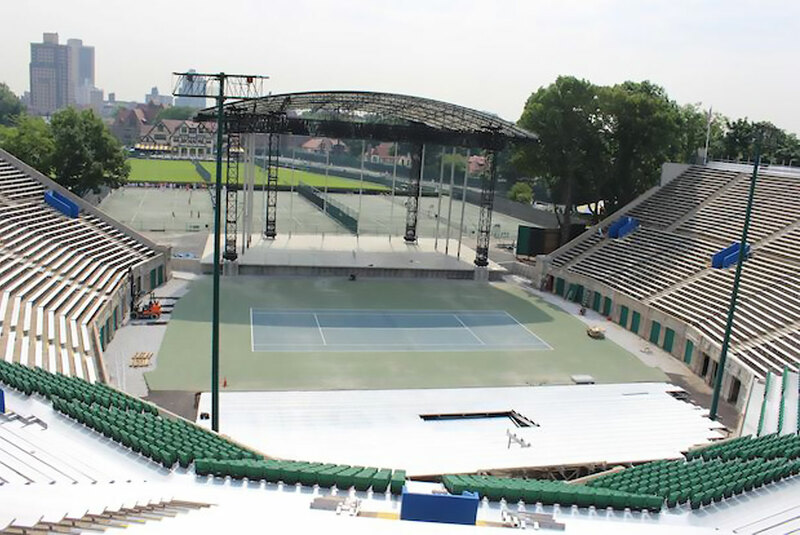 Seating Solutions created a roof canopy for this area that did not block spectators seated behind it avoiding any sightline obstructions. 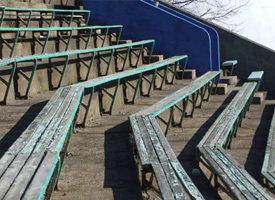 While on site, Seating Solutions continued to create solutions for many safety requirements. There were removable stage rails, a backstage private entertainment deck with Lexan view-through railing. 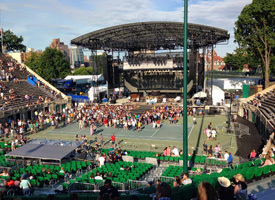 This venue is designed to include floor seating or standing room directly in front of the stage by utilizing Seating Solutions removable floor track seating system. 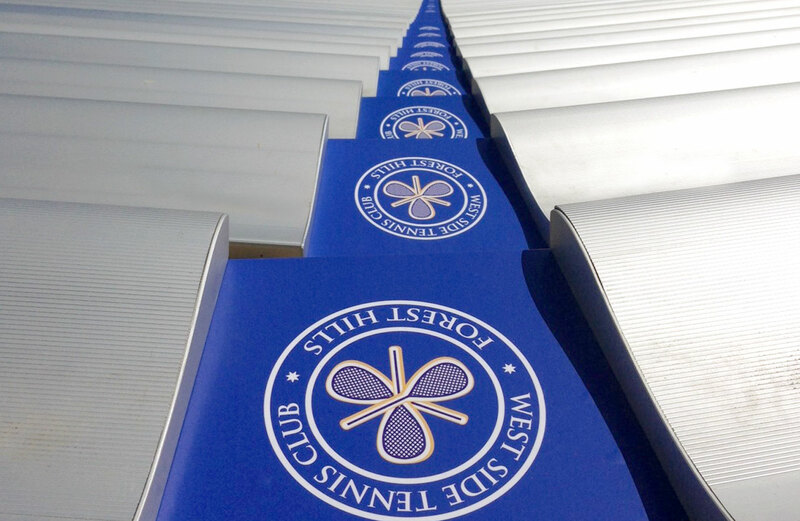 We can convert the standing room to 1,500 seated VIP flip up chairs in less than 6 hours. Our patented floor track system is far superior to folding chairs. 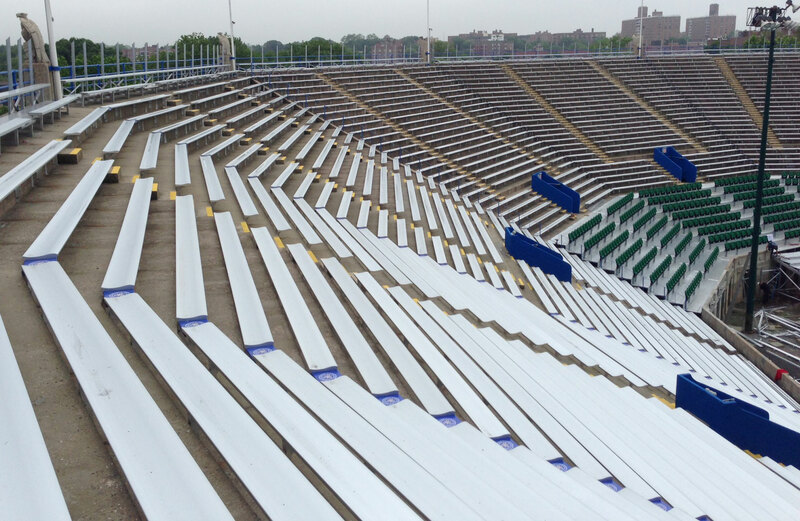 Floor track never requires straightening of rows between events and since the flip up seat utilizes less space than a folding chair per row you actually produce 15% more ticketed seating in the same space. This project had a very tight timeline. 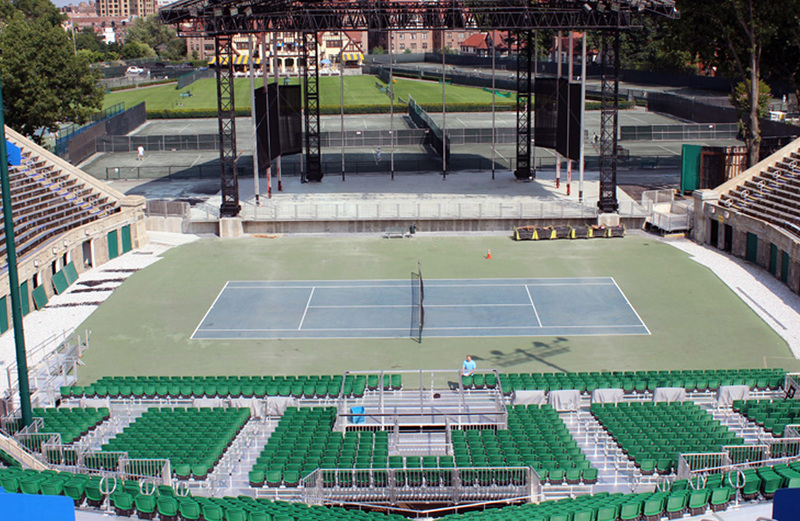 Because Seating Solutions worked directly with the promoter to design, manufacture and install the seating systems, we were able to prepare a quality venue in a very short window.